This painting was made by Mark Chagall in 1911 and is oil on canvas. 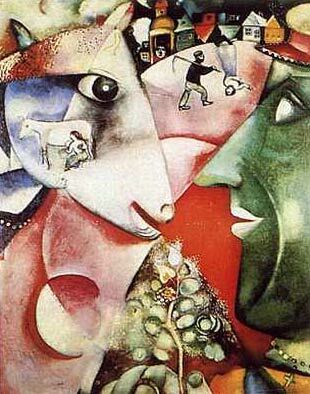 A lot of Chagall's work presents dreamlike imagery and this painting shows just that. In this painting there are images that are some what like a dream process of a cow which is placed on the left side of the painting. I think this painting is very interesting and cool to look at. There are so many images placed in it that a viewer is almost never bored looking for something new in the painting. The use of color also makes the painting very interesting. All the colors used are bright and fun to look at in the images they are used for.